History of Optics Trade store is the story of a passion that grew into a business. Optics Trade online store was born in 2011 when we decided that our blog of articles and reviews of Sport Optics (www.optics-info.com) will have to be upgraded somehow. Building on a wealth of experiences and a lot of passion for these products an online store was a natural step forward. Since that time we have grown to become an established online store with a versatile product range and substantial stock. Today we are an Authorised dealer for more than 30 different brands that you can find in our store. Even today, all members of our team share the same passion for sport optics, since we believe that this is a key element that binds our team together. Optics Trade is based in the European Union (Slovenia) and all the shipments are shipped from our warehouse. Even though our business has grown, we still have the same passion for these products that we had in our beginnings and we still test and review most of the products listed in our store. This gives us unique experience and knowledge in contrast to other similar companies, so that we are able to offer the best possible advising to our customers. Experts in our team will always be able to answer any of your questions and enquiries. We understand how difficult it can be when choosing the right product for you, when you have so many products to choose from. Even though they look similar at first glance, they have many different features and different optical performances. Send us an email to info@optics-trade.eu with your questions and we will be glad to help you. We always reply! Internet made the world global and we at Optics Trade are a part of it. We offer worldwide shipping and that really means that we ship everywhere. We use Express Mail Services and UPS services for that and in our experience we can get a shipment to any address in the world. All our shipments are really well-packed so that any damage to the products is prevented. If such an unpleasant situation would happen anyway or if a parcel would get lost, we have all shipments fully insured. Customers are always protected and can always expect a product replacement or money refund in any unpleasant/unexpected situation. We care about our reputation and would never allow any customer to have a bad experience with our store. You can read more about the shipping methods and pricing we offer here. All products can be viewed and tested at our business unit in Slovenska Bistrica, where we have our showroom and storage facilities for most products. Anyone interested in purchasing our products can visit us to see and try out our products. We can also offer expert advice and help with the selection. Our store offers the most complete range of sports optics and mounts in this part of Europe, as we have hundreds of different models of riflescopes, binoculars, mounts and other optical devices. during the week are every day from 8 am to 6 pm and Saturdays from 8 am to 12 pm. We are located at Industrijska Street (Industrijska ulica) 9 in Slovenska Bistrica, opposite the Veterinary hospital. 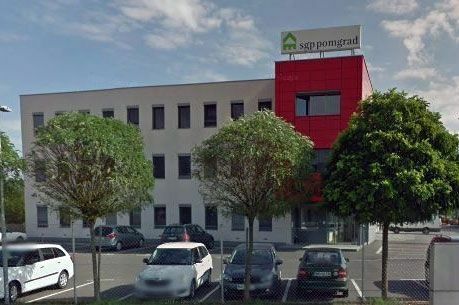 Our business unit is on the 1st floor of Pomgrad (red) building. In the direction of Ljubljana - Maribor, take the Slovenska Bistrica JUG exit. In the first roundabout, take the first exit, in the second roundabout, take the second exit, and in the last, third roundabout, take the first exit again. Go forward for 150m then and on your left you will see the red building with the "Pomgrad" sign on it. There are “Optics trade” banners hanged on a fence in front of the building. are the last cornerstone of our business that needs to be mentioned in this text about us. It is normal and can happen to anyone that you receive a product and once it is in your hands you see that it is not really the one you would like to have. We have great understanding in such cases and our Return policy offers you the option that in a time period of 14 days after you have received the product you just send it back to us and we will offer you a payment refund or product replacement. Whichever suits you best. The majority of products we sell are high-quality products with long warranty periods. Unfortunately, even with such products bad things can happen and in 1/10000 it can happen that you need a repair under warranty. In such cases, we offer our full support to our customers. You can ship the product back to us and we will deal with all procedures associated with warranty repairs by the Manufacturer. Since most of the Companies, producing optical products are located in Europe we offer all our customers from other parts of the world an option that we arrange the import and export of a product that needs repair so that any additional fees or taxes are avoided. Read more about our Warranty policy here.